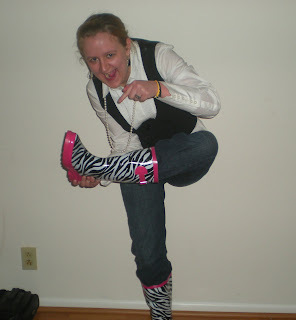 Rainy Rainy day in my zebra print rain boots. I love the rain always have. I love the smell before a summer afternoon shower. I love the life a spring rain blooms. Rain brings with her superb opportunity for afternoon naps, curling up with a good book, or an all day marathon of Aubrey Hepburn movies. In my world rain brings the good fortune to wear my rain boots. I have never been much of umbrella kind girl. I just don't mind getting rained on. Plus I have my spectacular boots. I call them my I can't possibly have a bad day boots. You just can't wear loudly printed boots without a smile. These fabulous boots bring out the inner punk girl in me. The I want to put pink highlights in my hair, add a new tattoo, and learn to play bass guitar boots, and at the same time have the magic ability to bring out my lighter child like side. The splash in the biggest mud puddle, and stick out my tongue and catch a few rain drops child. So for me the lover of a rainy day my zebra print trimmed, in pink rain boots just make me one happy dancing in the rain mommy!!! Plus on the more practical side they keep the bottom of my pant legs dry!! !